At ONTRAPORT, we’re acutely aware that email delivery (AKA “deliverability”), is a major concern for most clients, most notably, those clients who come to us from another email service. But what surprises some of our clients is learning that the responsibility of getting great inbox delivery lies not only with the ESP (us) but with the individual sender as well (you). We have many practices and standards set in place to ensure that delivery rates on our public pool of IPs remain healthy and provide a clearing for 100% inbox placement. We have meticulously set up our internal infrastructure to meet (and in many cases exceed) industry standards. For instance (get ready for some technical jargon here) every message that leaves our system is signed with DKIM, domain keys, and proper SPF records. In other words, we’re rigorously doing OUR part to ensure you get the best delivery. However, due to the current trend in the approach that ISPs are taking (Hotmail, Gmail, and Yahoo are the leaders here) a solid infrastructure on our end, just isn't enough. See, most major ESPs have implemented, or are currently working to implement “engagement judgment” features that allow e-mail recipients to only see messages coming from the senders with whom they are most engaged. This creates an environment where list hygiene and an ever-growing degree of relevance in your communications are more important than ever (and they’ve been pretty important, for a good while, so that’s saying something.) Read more about Gmail's engagement judgement program and what it means to you! Employing list-hygiene strategies, like active “re-engagement campaigns” (that work to auto re-engage anyone who hasn't clicked or opened in x months) are helping e-mail marketers maintain their hard-earned place in the in-box. Also, higher value conversational content is simply a “must” for you now. You need to get your recipients to engage with your messages. ISPs consider opens, link clicks, forwarding, and even time spent reading your e-mails to be engagement. You can learn more about engagement here. Further if you can get your people to reply to your messages, their ISP will notice that and will regard mail from you as being “important” to them, and will continue to drop it into their inbox. In most cases, when they reply to you, you'll also be added to their address book (which is the simplest form of whitelisting). Also, using “double opt- in” practices can contribute greatly to good inbox delivery as well. On top of all the above challenges you face in the battle for the inbox is the added challenge of keeping your e-mail content passable. While there is no single way to have messages pass content filters there are many things that one can do to help ensure successful (and timely) message delivery. Click the troubleshooting tree to open a larger version in a new window. Always include a text version of your email. 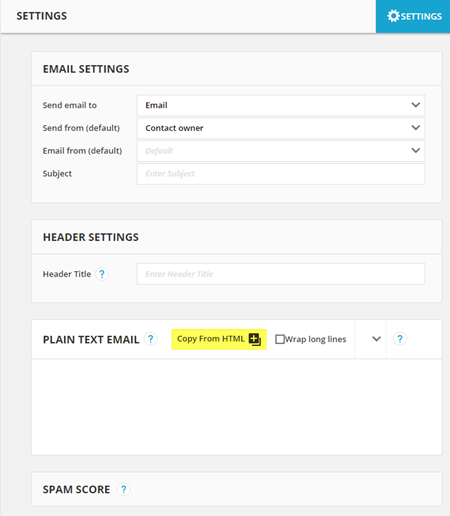 When finished creating your email message, don't forget to click the Copy from HTML button to populate the Plain Text Email section. In the standard HTML Email editor it is right below the HTML email editor window. In the ONTRAmail editor, click the Settings tab to locate the button. Don’t use public URL shorteners. By using a URL shortener you are linking yourself in with the reputation of millions of other users. Spammers frequently use these services to hide links that go to scam sites thus the ESPs now have a very small tolerance for bulk messages with URL shorteners in the body. When providing a link in your e-mails, use linked anchor text, instead of including the whole URL: pasting entire URLs into your message body can set off SPAM triggers, because scammers sometimes include URL’s that actually link to a different page than the one they appear to link to, in order to get catch people off guard and get ‘em to enter their credit card details into a scam site. Rather than pasting the whole URL into the body of the e-mail, simply type “click here,” (or whatever you choose) then highlight the word “here,” (which is the anchor text), click the link button and paste the link in the URL field provided. Keep things consistent! If it looks like spam (many different colors of text, different sizes, random bolding, purposeful misspellings of words) your likelihood of reaching the inbox unscathed is greatly decreased. There are rules built right into the ESP’s filtration systems that look for these things, including Spam Assassin, the leading open source spam filtration system. Ensure you have a good image-to-text ratio. I suggest 20% images at most and at least 80% text), if your Email consists mostly of an image you are likely to be blocked. This is a method many spammers used to by pass content filters, since the spam checkers cannot check what an image says. One of the things we do to maintain solid reputation is monitor messages leaving our system and hold all our clients to a maximum 0.1% complaint rate and a 7% hard bounce rate. We are always working on implementing new features and updating existing ones such as active content spam scoring, grey listing of poor lists, and a filter for our importing system. Each of these features and processes safeguard our sending reputation. In this video we'll show you how to isolate a group of contacts that have been unsubscribed from your mailings as a result of a bounce. Read our Getting Your Email Delivered eBook!